There is something truly great about small town Maine. It is the ability to park your car and enjoy walking around from shop to shop, museum to historical house, and finding the perfect morning coffee, afternoon lunch spot, and local dinner flavor all without having to get back in your car and drive. If its nature and adventure you are looking for on this vacation there are plenty of golfing, state parks, nature preserves, and rental shops to get your fit-cation started. There is truly something for everyone in your vacation family to explore when choosing to rent one of our beautiful properties. This section is a compilation of our staff’s favorite things to do by location and some bucket list items that still are yet to be explored. Be sure to share your favorite pictures with us from your outings. Welcome to Southern Mid Coast Maine. Miles of pristine coastline offer sandy beaches, ocean vistas, historic lighthouses and fresh lobster. Vibrant downtowns provide endless choices for shopping, dining, lodging, recreation and entertainment. Explore Maine`s Mid Coast area by starting with this website! For more information, please feel free to contact us at any time. 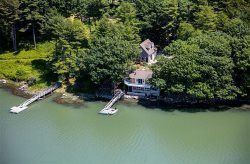 Edgecomb, Wiscasset and Westport Island: These are some of the interesting and beautiful communities surrounding the Boothbay Region. Each has special features, all share their connection to the rivers and the sea. The history of the region is reflected in their architecture and traditions. While we have several long sandy beaches (Popham, Reid State Park and Pemaquid), we are known for having wonderful rocky shores with seaweed and tidal pools. Small beaches of sand or pebbles are scattered like hidden treasures between the protecting ridges of granite that run down into the sea. Midcast Maine is dotted with many Land Trust Properties for hiking and has several designated Bike Trails. Another great way to enjoy your vacation, many of these are dog friendly. Book a trip out on a boat or relax and fish on one of these premiere boating excursions. The Town of Brunswick, the gateway to Maine�s magnificent mid coast, is an eminently livable community with much to offer residents, businesses, students and visitors. Harpswell is composed of land contiguous with the rest of Cumberland County, called Harpswell Neck, as well as several large and small islands: Sebascodegan Island (locally known as Great Island), Orr`s Island, and Bailey Island. Harpswell is part of the Portland�South Portland�Biddeford, Maine Metropolitan Statistical Area.Bailey Island is an island in Casco Bay, and a part of the town of Harpswell. The world`s only Cribstone Bridge is located here and connects Orr Island and Bailey`s Island. Visit our local farmers markets for the fresh, local fruits, vegetables, cheese, meats, specialty items and more! Eat local, eat healthy! Maine is known for some great festivals and the Boothbay area has some of the best! From the mainly locals Fisherman`s Festival and the carp relay race to the majestic beauty of the Windjammers Festivals to the delicious decadence of the annual Claw Down, our festivals have something for everyone! So if you were looking for a reason to come to Boothbay, here it is! You find the festival, we`ll help you find the perfect cottage for you and your family! Georgetown is a seaside town in Sagadahoc County, Maine. Home to Reid State Park, the town is part of the PortlandSouth PortlandBiddeford, Maine Metropolitan Statistical Area. Located on an island accessible by car from the mainland, Georgetown includes the villages of Five Islands, Georgetown, Bay Point, Marrtown, West Georgetown and Robinhood. It is a popular tourist destination Celebrating their 300th Anniversary in 2016!